Aston Villa midfielder Jack Grealish was attacked by a spectator who ran on to the pitch in the Championship match at rivals Birmingham City on Sunday. The incident happened in the 10th minute when a man entered the pitch from the home section before swinging his arm towards Grealish's face. He then blew kisses towards the crowd as he was led away by stewards. A man, named by police as 27-year-old Paul Mitchell, of Rubery, was arrested and will appear in court on Monday. He will appear in Birmingham Magistrates' Court charged with encroachment on to the pitch and assault. "An attack on a player is completely unacceptable and outrageous," said the match commander, Superintendent Nick Rowe. "The vast majority of people were well behaved but unfortunately the occasion has been marred by this." The visitors went on to win 1-0, Grealish scoring the winner in the 67th minute. The Football Association said it "strongly condemned the incident", adding that it would be "working with the police, the relevant authorities and the club to ensure the appropriate action is taken". The EFL added: "It's a situation no player should ever be faced with. "Those playing in the game must be able to do so safe in the knowledge they will not be subjected to this type of behaviour. "While this incident falls within the remit of the Football Association, we will work with all the relevant parties to address the issue of player and match officials' safety on the pitch and ensure the appropriate action is taken." Birmingham apologised to Grealish and Villa immediately after the game and added that they would be reviewing their stadium safety procedures. "We deplore the behaviour of the individual who committed this act and rest assured he will be banned from St Andrew's for life," said a Blues statement. Aston Villa said they were "appalled by the disgraceful attack" and that a "red line has been crossed by this cowardly on-field assault". "Local rivalries are part of the fabric of the game. However, as we are sure our friends at Birmingham City would agree, to have a player's personal safety placed under such jeopardy is a serious cause for concern for the entire football community," said a Villa statement. 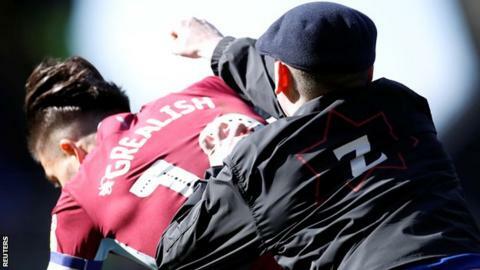 Police later confirmed that a steward was "spoken to" after television footage appeared to show him pushing Grealish, but no offence had been reported. The managers of both clubs, Birmingham boss Garry Monk and Villa's Dean Smith, said such an incident "should never happen on a football pitch". "The players' safety is paramount," said Smith. "They're going out on the pitch to entertain 20,000 fans. That's their job. "I'm for local rivalry. It's great, but there has to be a line drawn. It's disgraceful but we need to educate society a bit." Monk, who later called the incident a "disgusting act" in a tweet, said that the man should receive the "ultimate" available punishment. "But, from my experiences over my year here, I have to say that one idiot does not represent what these fans are about," he added. "It shouldn't tarnish the reputation of the rest of them." Former Birmingham midfielder Darren Carter said on BBC WM radio: "It is a rivalry and you get passionate, but you should never come on to the pitch. That is diabolical behaviour." Sunday also saw an incident in which a spectator was arrested after running on to the pitch and shoving Manchester United defender Chris Smalling during their loss to Arsenal.